The auctions are not live yet. They begin Wednesday, July 17th at 6pm PST until Saturday, July 27th at 5:59pm PST. 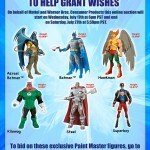 You will be able to view the auctions at the Make-A-Wish Ebay Store. We’ll post a reminder when the auctions go live.